Today it’s a nice day and I’m here, listening to music and thinking about horror movies. Yes, I know, who thinks about horror movies when the sun is shining brightly and it’s a beautiful day? Well, it all started yesterday when the girls wanted to see “The Ring”, the American version with Naomi Watts. Nowadays they seem to enjoy these movies. They enjoy getting scared. I enjoy it too, but most of the time these movies make me laugh. I guess it is not that easy to scare me and I know almost all the clichés. I have always liked horror movies and, I must admit, movies about serial killers too. I guess it has a lot to do with my mother. She loves them too and I enjoy seeing them with her. It is a good movie indeed. It was released in 1975 (a year before I was born) and it had quite an impact on the people who saw it. I guess it still has. Every time I swim at the ocean I pray not to find a shark. The idea of a shark attack terrifies me to the bones. “The Empire of the Ants” (1977) with the very famous actress from Dynasty, Joan Collins. Nobody is scared of ants. Most of the time they are harmless, but, imagine thousands of humongous ants chasing you… how about that? What about spiders? If you can’t stand them, this is not the movie for you: The Kingdom of the Spiders (1977). In order to survive, an incredibly large amount of fearless tarantulas are ready to attack and kill any living being they run into. I don’t remember much about this movie, except the ending. I just want to say that it is definitely not a happy ending. It is impossible to forget. It gave me the creeps. It still does. Then there is this movie with a beautiful song: Ben (1972). I hate rats and I was too young, so I just remember a few scenes. What’s unbelievable is that such a nice song was written for such an evil rat. So Ben is the leader of an army of rats. I just can’t imagine being surrounded by rats: one is more than enough! By the way, the song was sung by Michael Jackson and the movie is a sequel to another movie about rats I haven’t seen yet: Willard (1971). There’s a remake of this film (Willard) but I’m not so fond of horror movies’ remakes. They are usually terrible. Even when I was little I used to enjoy these movies, but there was one that got me: Alligator (1980). A small alligator fed on animals that were used for some experiments. Due to this, the alligator became enormous and had an insatiable appetite. Of course it ate a lot of people. But there’s a very stressing scene that stayed with me for years: Kids were playing at a pool party. There was a kid with his eyes covered, his friends were going to throw him to the water. Just before they threw him, he was able to see the alligator waiting for him in the pool. He shouted but nobody else saw it. So the alligator ate the boy. I saw the movie when I was about 7/8 years old. I was part of a swimming team. I went swimming every day and when the class was over, my teammates and I played at the pool. You’ll probably laugh at me, but I always looked for someone to stay with me at the pool. I was always aware of everything around me. I didn’t want to have such an encounter as the one that poor boy had. Besides these movies about evil insects and animals, there are the ones about the devil. I guess that for some people these are really difficult to watch, not for me. I find these movies interesting even though they are not my favorite. The one I like the most is the Omen (1976), the first one. There are many sequels to this story, but none of them are as good as the first one. It’s the story of Damien, a little boy who’s the Antichrist. It’s a good horror story with drama, suspense, and good actors like Gregory Peck. It’s one of my mother’s favorite movies. I saw it with her more than once. We saw the sequels too but they didn’t have an impact on me. I barely remember them. Then there’s the Exorcist (1973) with Ellen Burstyn and Linda Blair. This movie scared a lot of people when it was released. It’s a strong story with great effects. Little Regan is possessed by a very powerful demon that forces her to do horrible things. There are very impressive scenes like the one where Regan’s head turns completely around backwards. Besides, the theme music is great. I’m pretty sure that many of you are familiar with this theme even if you haven’t seen the movie. Nowadays there are many movies about exorcisms. Some of them claim to be based on true stories. Maybe they are, maybe they aren’t; but none of them are as good as this one. Some of them are even boring or tell the same story with different actors. Due to this reason, I stopped watching movies about exorcisms. Then, last year, my husband told me about one I should see: The Exorcism of Emily Rose (2005). We saw it together and I liked it. It’s not as impressive as the Exorcist but it is more realistic. Apparently it’s based on a true story. Could something like this really happen? At the end of the seventies and beginning of the eighties some very interesting, violent, and dangerous characters were created. For some people they are really scary or horrible. It doesn’t really matter how they look like because these villains can be so attractive (regarding their personality) or funny ( I love black humor) that one just has to see them even though some of these movies are really bad. Yes, some are bad but they are worth it because of the villains. For me it has been fun to watch some of this movies. By the way, most of these movies became franchises, so nowadays almost everyone knows about them. Even some remakes have been made. Let’s begin with the first villain I met: Michael Myers (and no, he’s not the actor from Wayne’s World or Austin Powers), the serial killer from Halloween (1978). Michael Myers killed his sister when he was 6 years old. He spent many years at a psychiatric hospital. Obviously he escaped and he was ready to kill. This was the first movie of I don’t know how many sequels. Michael Myers was the first of a series of unkillable “human-monsters”. I only saw one or two movies. Then there’s Jason from Friday The 13th (1980). I don’t know him that well because it’s the one I like the least. Camp Crystal lake was closed because murders happened there. Many years later it was reopened and the killer is on the loose. Jason is there, ready to kill them all. In this movie we can see a very young Kevin Bacon who won’t survive Jason’s attack. So beware of you what you dream or take sleeping pills to avoid dreaming. 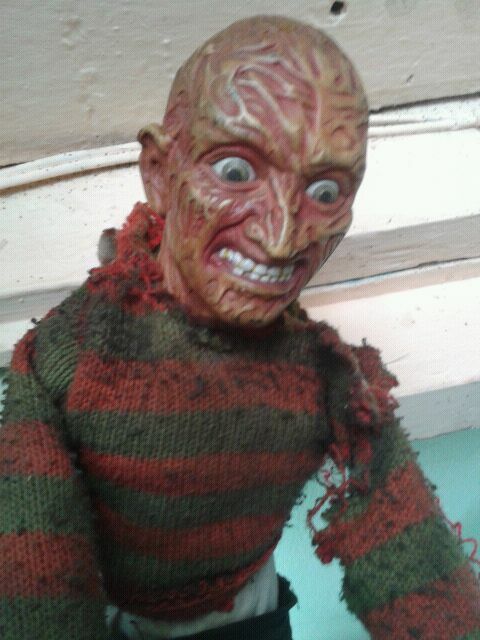 By the way, this was Johnny Depp’s first movie and Robert Englund is the best Freddy Krueger ever. I enjoyed some of the sequels but I wish I hadn’t seen the 2010 remake! 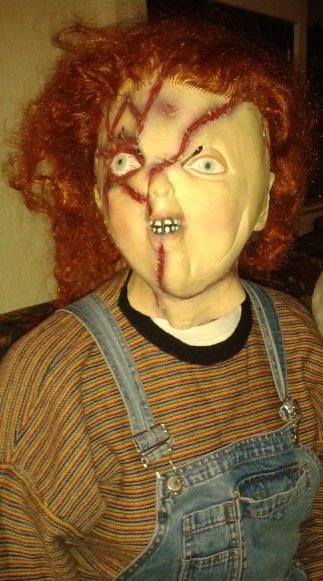 Then there’s this terrifying doll: Chucky (Child’s Play 1988). A criminal named Charles Lee Ray (Chucky) is fatally wounded at a toy store, in order to escape death, he transfers his soul to a talking doll. He didn’t want to be a doll forever and in order to be human again he needed to put his soul into the first human being he told his secret to. This person was the boy who owned him, who loved this doll. Of course, in the meantime, Chucky has to kill because he really enjoys that. I liked the first three movies. Nowadays there are more horror franchises, but I’m not so interested in them. In the nineties, there was Ghostface from Scream, another serial killer with a mask. The only think I liked was the mask, it reminds me of “The Scream” painted by Edvard Munch. Other than that the movie is full of clichés, very predictable. Ok, the first one made me laugh but I refused to watch the sequels. Then there was I Know What You Did Last Summer (1997) with Jennifer Love Hewitt and Sarah Michelle Gellar. I didn’t even finish watching this movie, it was not what I expected. Nowadays I believe that the special effects scenes are more important than the story itself and in some cases, there are are too many blood scenes. So I’m not into Saw either. But well, there’s an exception: Final Destination (2000). The first movie it’s not that bad. Actually, the idea is quite interesting. There’s no ghost, monster or serial killer. It’s death itself the one whose after the main characters. The sequels are no different from the original but the deaths are even more violent than in the first movie. There’s too much blood in these movies. But enough about franchises. Honestly not all horror movies are about unkillable serial killers, giant animals/insects, exorcisms or monsters. There is more to it than that. What about mysterious unexplainable things happening, ghosts, weird situations, common people with unusual powers or not so powerful psychopaths but very brilliant? I guess these are the movies that I enjoy the most and the ones more likely to scare me. I just saw a few during my childhood years. Nowadays everyone talks about bullying as if it never happened before. Bullying has always been there, just, many years ago, adults didn’t pay much attention to that. Now we know that it is one of the worst things that could happen to a child/teenager (student). Unfortunately the person who is being bullied, usually keeps his/her suffering for him or herself and that makes it easier for others to take advantage of him or her. Nevertheless, sometimes things change. Beware of whom you laugh at! You may run into someone like Carrie, who can do a lot of damage when she’s stressed, hurt or angry. I was a little girl when I saw Stephen King’s Carrie (1976) for the first time. The ending is impressive. No wonder Sissy Spacek became so famous, she’s a really good actress. John Travolta also participates in this movie. Most of the movies I saw during my childhood where chosen by my mother. I just had to tell her what kind of movie I wanted to watch, and she recommended or found one or two regarding that subject. I remember two great films she got for me that have nothing to do with monsters nor psychokillers. This one is addressed to children (I think): The Watcher in the Woods (180); actually it’s a Disney movie and with one of the best actresses: Bette Davis. Many years ago, Karen, Mrs. Aylwood daughter, disappeared. Nobody knows what happened to her. A family arrived to live there, in the manor, and very strange things began to happen… I loved this movie and still do. I saw it with my brother and sister. There were some scary moments and it was fun. One afternoon, when we were 12 years old, my cousin and I were looking forward to seeing a good movie. We were home alone, and before leaving, my mother gave us “Audrey Rose” (1977). It’s the best movie about reincarnation that I have seen. It’s stressing and it was scary when I was 12. Now it is just stressing. Ivy Templeton is a girl with nightmares that worsen by the time of her birthday. There’s a man (a very young Anthony Hopkins) who claims that Audrey is the reincarnation of her daughter who had a horrible death. When the movie ended that time, my cousin and I were really nervous. It was not a good idea to be home alone at that moment. Nowadays it’s one of my favorite movies. These are the horror movies I saw when I was a child, the ones that I remember. They made me feel scared or they made me laugh. They made me feel something and I enjoyed them for that. It was fun for me and most of all I loved watching them with my mother. Some people believe that watching these movies may be harmful for children. Well, it wasn’t harmful for me because my mother was there for me to guide me. So it wasn’t a shocking experience and I didn’t become a violent person. I was a happy child and I am a happy woman now. There are only two things that I had to deal with after seeing some of these movies: my fear of encountering a shark when I swim at the ocean and the feeling of discomfort when I’m alone at a pool. But I love swimming and that won’t ever stop me. There are still many horror movies that should be mentioned. I’ll do it soon when I write about the movies I saw when I was a teenager and the ones I have watched during my adulthood. And before I finish, I must confess something, today the thing I like the most about horror movies, is the reaction of the people who get scared while seeing them. I know it sounds crazy, but I enjoy it. ~ por Naraluna en mayo 29, 2013. I think the first horror movie I saw was Jack Arnold’s TARANTULA (1955), that really frightened me out of my wits and is for sure one reason for my arachnophobia. But the KINGDOM OF SPIDERS was just as bad, especially the sight of the cobwebby town at the end. This entry was posted on mayo 29, 2013 at 9:26 pm and is filed under movies and biography.You can follow any responses to this entry through the RSS 2.0 feed.You can leave a response, or trackback from your own site. Previous: Libros impresos y digitales. Next: Blasitos. Mis abuelos. /My Grandparents.